Facebook has revealed the trends, songs, people, movies, TV shows and memes that created a buzz among its billion users in 2012. In the 2012 Year In Review, U.S. president Barack Obama was the most prominent person and political figure, while the presidential election was the most talked-about event on the social network. The most popular song (presumably meaning most shared?) was We Are Young by Fun, followed by Somebody That I Used To Know by Gotye and, of course, Call Me Maybe by Carly Rae Jespen. Where's Gangnam Style, you ask? Well, the most viewed YouTube clip of all time was only listed among 2012's top memes on Facebook. Popular TV shows Duck Dynasty (a reality show about rich hunting rednecks) and Honey Boo Boo (another reality show about a child beauty pageant contestant) provoked the most discussion. The Hunger Games was the most buzzworthy book and movie of the year on Facebook. Meanwhile, the most number of local check-ins came from Times Square, New York and Disneyland in California. The most talked about tech of the year was Instagram, Facebook's own Timeline, Pinterest, Draw Something and the iPhone 5. 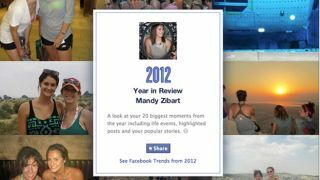 Facebook is also allowing users to see their own highlights via Facebook.com/yearinreview. The pages feature a neat rotating slideshow of the user's photos and a Timeline of their most important events and posts of the year. It's pretty neat.